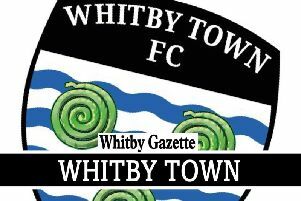 Whitby Town travel to Merseysiders Marine, this Saturday, hoping for better fortune than their last visit. The Blues led until the 75th minute, but had to settle for a point when John Shaw’s cross turned shot hit Ibby Hassan, looped over goalkeeper Shane Bland and dropped into the net. However, the right wing-back hasn’t held it against the third-bottom outfit. Town have a good record at the Mariners’ Arriva Stadium, winning three of their last four visits. The Crosby club, who have been in the Northern Premier League longer than anyone else, have won just once in their last 11 games and find themselves 11 points from safety. They parted company with manager Carl Macauley this week. Meanwhile, Blues player-manager Darren Williams praised super-sub Robert Nolan and feels it is “just a matter of time” before the ex-Blyth striker starts for Town. “He gives us something we don’t have,” Williams admitted. The Blues boss also acknowledges Town’s decent form at the North West outfit, but won’t be wanting a flat display like that against Marine’s fellow strugglers Belper recently. “We’ve had some good times there,” he said. “It’s a bit of a good hunting ground for us – we were disappointed last year, I felt we deserved more out of game again. The Seasiders are planning a strong end to the season off the field as well. WTFC’s Easter Draw, which is crucial for the club’s finances has over £1,200 in cash awards with 20 prizes in total. Printing costs are also sponsored, so every ticket sold goes straight into club funds. The star prize is £500 cash. It’s £1 per ticket, £5 per book, if anyone would like to buy a book or could sell a few, please contact Eddie McNamee of the Whitby Town committee on 07969 812375. The draw takes place on Easter Monday 6 April, after the home derby with West Yorkshire’s Frickley Athletic.